Market timing is a great strategy if you know what the market is going to do and when. The problem is most people (if not everyone) do not know when the next market downfall or bull run is going to happen. That is why long term investing usually trumps short term speculating. Nevertheless, there is another option. What if you just waited to start investing? What if you held onto cash and waited for the market to drop of 15% (or 10%, or 20%) and then you jumped in right when the market was at its lowest point. We’ll dive into that analysis and see if it works, but first, a primer on stock market timing and why it’s so enticing. What Is Stock Market Timing? How Do Average Investors Time The Market? Market timing is exactly what it sounds like. An investment strategy that involves putting money into and pulling money out of the market at certain times to maximize your investment. You’re buying during the lows and selling during the highs. Usually, advanced market timers rely on timing signals or a formula or algorithm to help determine when the market is down and when it is up. In hindsight, when using these market signals it’s easy to see the many peaks and valleys of the stock market and imagine buying and selling at the exact right times. Though, it’s much harder to predict in the present moment. Does anyone really know when the market is going to go up or down? I doubt it. As mentioned, market timing works when you buy the lows and sell the highs. There are many technical strategies that professional stock traders employ to try to time the market. They can do complex timing signal analysis with 50 or 200-day moving averages to guess whether or not we are in a bull or bear market. Though, this analysis is beyond the means of most average investors. Instead, most investors look at a simpler market timing strategy. Hold your cash and buy when the market dips by a certain percentage (i.e. 10%, 15% or 20%). It’s a good question to ask yourself and we’ll dive into the analysis now to see if you should take action or try to time the market. So, the headline spoils it. Market timing does not work, usually. I didn’t want to lead you along too far, thinking I had the secret formula to crack the market. Believe me, I wish I had that secret formula too. Instead, I looked at a common market timing strategy. Hold your cash until the market drops 15% from it’s previous 5 year high. Then, invest! I ran a bunch of scenarios with the following assumptions. Specifically, I ran 1,191 scenarios (months) from 1920 to now. Each month represented a period of time in which you could start investing, or wait for the next month to see if you got that market dip. And so on. 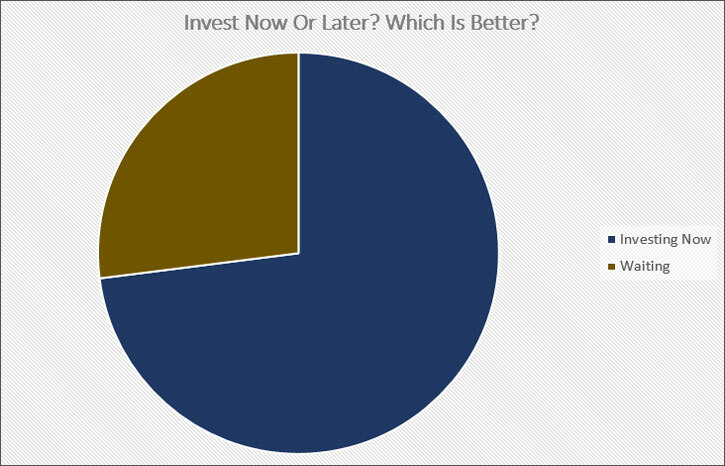 In 73% of those scenarios you would be better off investing now rather than waiting for a market dip in some future month. That means in 27% of scenarios, barely of one quarter, you would come out ahead by waiting for a 15% dip to invest. Most of the time, the market just keeps going up! 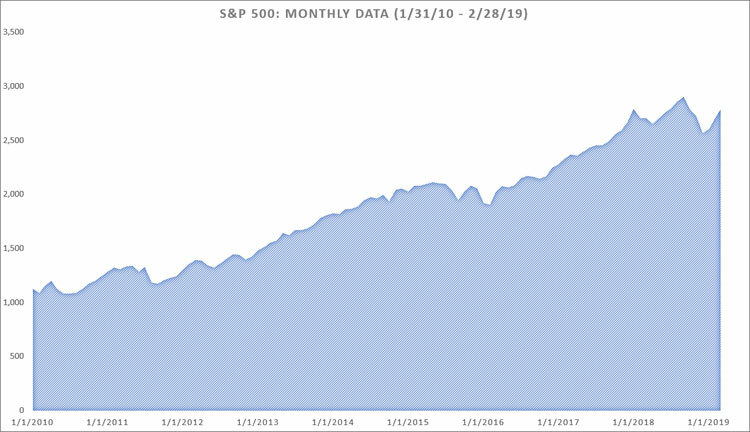 Usually, by the time the market dips 15% from its previous 5 year peak, it’s already long surpassed where the market was when you first decided to wait. The end result is you would be better off using a buy and hold strategy over market timing. Just look at the 2010 decade so far as an example. This is what the market looked like starting in 2010. It’s been a good decade so far for non-market timers. Those who invested the $10,000 on Jan 1, 2010 would now have $24,780. That is a 148% return! But if what if you waited for the market to drop 15% from it’s high and then put your money in? You’d have $10,000. That’s right, the market never dropped 15% from it’s high in the current decade so far! You’d be stuck still holding onto your cash while your neighbors more than doubled their money! The market was slightly more volatile in the early 2000s thanks to the internet boom (and crash) and the housing crisis in 2009. It’s often referred to as the lost decade. 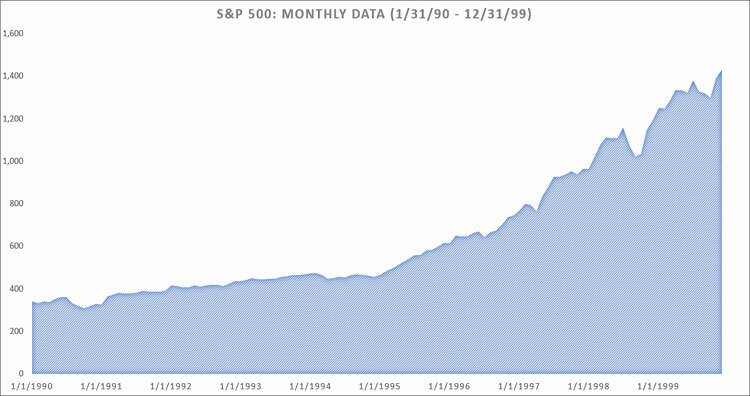 $10,000 invested on Jan 1, 2000 did not fare well for the next 10 years. You’d end the decade with just $7,789. 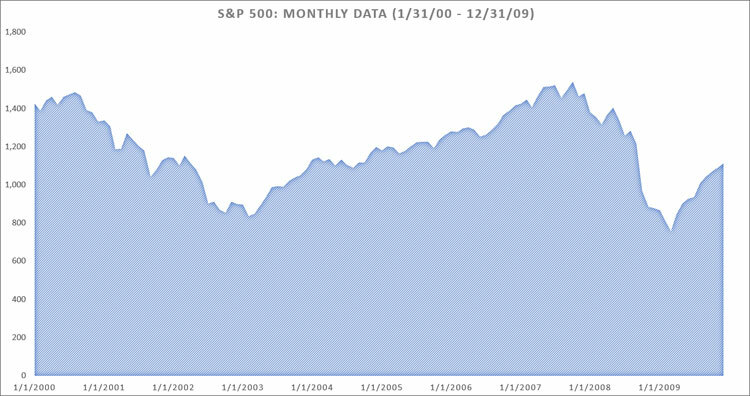 As you can see from the graph, the market took a nose dive right at the start of the decade. So in this scenario, you’d be better off if you would have waited for the 15% decline. You’d end the decade with $9,364. Similar to 2010 to now, the 1990s was a good time to be in the market. $10,000 invested on Jan 1, 1990 would have grown to over $32,000. The market more than tripled in value during that decade! Up to now, we’ve been looking at 10 year periods to get to the answer as to whether or not market timing works. And for most examples, it does not work over these long periods of time. In fact, you can expect to get positive returns 87% of the time by simply buying and holding your investment for a long time. However, if you try to time the market and go in and out in 1 year, you are only 69% likely to get positive results. That is a lot of work for a worse success rate. But what if we looked at smaller periods of time? There are cases where timing the market would work. But you would have to buy in on the days when the market dropped significantly. And during these times, no one knows where the bottom is going to be. For example, look at the great recession in 2008-2009. Here are the biggest swings in the S&P 500 during this time. On the day the S&P 500 Index lost over 100 points, you might think to buy. But you might not, thinking the market is going to drop farther. But just two weeks later, it jumped over 100 points. Then another 100 points two weeks later. The point is, to time the market and make money, you have to be lucky. Missing out on just a day or two can turn profit into losses. Yes, there are examples of market timing working. Actually, there are 322 of them in the past 100 or so years of investing (when looking at opportunities monthly). The bottom line is, the times that market timing worked are rare. They only happened in 27% of the months examined. You have better odds in Vegas! In the vast majority of cases, you are better off in the long term if you invest your money today rather than trying to time the market. The market timing scenarios we looked at only included buying at market lows. There are some who seek to then sell at market highs too. And then repeat the process. Again, I think you’ll find the same success rate with selling at highs as you saw with buying at lows. You also might miss out some great gains when you sell at what you think is a high but is really just the start to a long bull run. Besides that though, there are two other factors to consider. Transaction costs. These occur every time you buy and sell an investment vehicle. 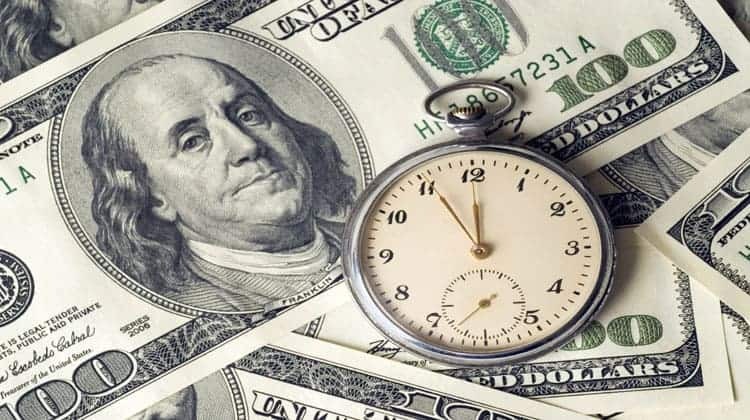 Market timing involves more frequent buying and selling, and therefore more frequent transaction costs. Taxes. Taxes occur every time you sell an investment vehicle as well. They eat away at your capital and when you go to reinvest at a market low, you are reinvesting with less money than you otherwise would have had. On top of that, if you sell an investment you held for less than a year, you are subject to short term capital gains tax rather than long term capital gains tax. As I’m sure you guessed, short term capital gains tax is more expensive. Timing the market only works 27% of the time when you are waiting for the next market dip. The caveat is, if you somehow know when the market is going to go up or down, of course market timing will work! In that case, you’ve got the magic bullet! And theoretically you can make unlimited amounts of money with this knowledge. The issue is, though many people may think they do have this information, I don’t think anyone has the knowledge of what the market will do next. And as a result, most of us are stuck with a 27% chance of success. Author Bio: Just Start Investing is a personal finance website that makes investing easy. Learn the simple strategies to start investing today, as well as ways to optimize your credit cards, banking and budget.